Can You Take a Multivitamin With Cymbalta? The antidepressant Cymbalta interacts with a substantial number of drugs and dietary supplements, but multivitamins are not on the list. Even prenatal multivitamins and formulations containing iron, minerals or fluoride are generally safe to take with Cymbalta. However, tell your physician about your multivitamin regimen and any side effects it seems to cause. Cymbalta is the brand name for duloxetine hydrochloride, an antidepressant that affects the neurotransmitters serotonin and norepinephrine. Cymbalta is prescribed to treat certain types of depression, anxiety and chronic pain. Multivitamins don't have any known interactions with Cymbalta, but many other drugs do. Antidepressants, antipsychotics, antianxiety drugs, cold and allergy medicines, blood thinners, over-the-counter and prescription pain relievers, antacids, diuretics, antibiotics, St. John's wort, the amino acid L-tryptophan and migraine medications all potentially cause unpleasant or dangerous interactions. Cymbalta interacts with more than 500 other drugs, so disclose your full medication regimen to your prescribing physician, including over-the-counter drugs. Both Cymbalta and multivitamins may cause mild nausea and headache. If taking the two together accentuates these or other mild symptoms, try taking them separately or with food. These side effects are not usually serious, but seek medical advice if they don't resolve on their own. 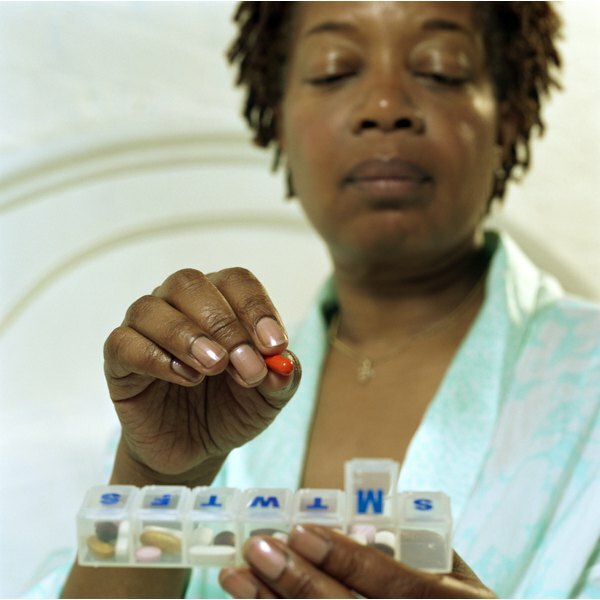 Your doctor may suggest changes to your medication schedule, such as temporarily discontinuing the multivitamin. It's not clear that multivitamins provide much health benefit. Certain multivitamin components -- vitamin D, calcium and folic acid -- appear to protect women's health, but other components, such as beta carotene and vitamin E, may be useless or harmful. Supplemental vitamins are crucial for anyone with a deficiency disease, but healthy adults may not need them. A balanced diet often provides adequate amounts of essential nutrients, and you can fill in particular shortfalls, such as vitamin D, with single-vitamin supplements. Multivitamins are safe if taken at recommended doses, but overdoses pose dangers. Never take extra multivitamins, especially any containing minerals or the fat-soluble vitamins A, D, E and K. Take Cymbalta exactly as prescribed. Besides interacting with numerous medications, Cymbalta also interacts with alcohol and caffeine. Caffeine tends to increase blood levels of Cymbalta, while alcohol and Cymbalta in combination can damage the liver. Avoid these substances while on Cymbalta or follow your doctor's advice about safe limits. Seek medical attention for severe side effects from Cymbalta, especially suicidal thoughts, allergic reactions, lightheadedness or fainting, agitation, difficulty urinating or any severe pain.